Hello there, I'm Jimmy Vegas. Welcome to my Patreon page. Let's get straight to it. Yes, Jimmy is actually my name. I'm 33 and I live in the United Kingdom. Since 2014 I have presented hundreds of Unity tutorials on YouTube for FREE. All the tutorials you see on my channel are the result of years of hard work and knowledge brought into video form for you to learn from. I won't be giving up any time soon either - this is my passion for life. Quite literally EVERYTHING I do on YouTube is free for anybody anywhere but for everything to work out I rely on the support from fans. Patreon is a great way of connecting with the fans and viewers on a much more personal level, and it also gives them a chance to receive personalized rewards, such as project files and livestream sponsors. Remember: You can always decrease or cancel your pledge completely if you aren't happy! All of my tutorials for Unity, free assets, free scripts are a great place to start and I do my best to offer support when you have problems in the Unity engine. Becoming a Patron here entitles you to a whole lot more than just the standard stuff. The more support I get, the more I can give. Going full-time with Unity is something which is absolutely possible. Project files issued will be at the time of the latest tutorial for the series requested. I would like JV Unity to be my only job and dedicate all my time to supporting the viewers. I have the knowledge, experience and confidence to make this a reality, but without the support of my fans, I am a little limited on what I can produce. I would like to thank you all for your generosity and support here on Patreon as well as on YouTube. Everything you guys do helps me become a better tutor and in turn helps you all become better developers. Our appreciation in the form of an email with our sincere thanks and gratitude. A personal mention on our website and our channel. Early access to all our tutorials on YouTube - See them upto 48 hours before everybody else! 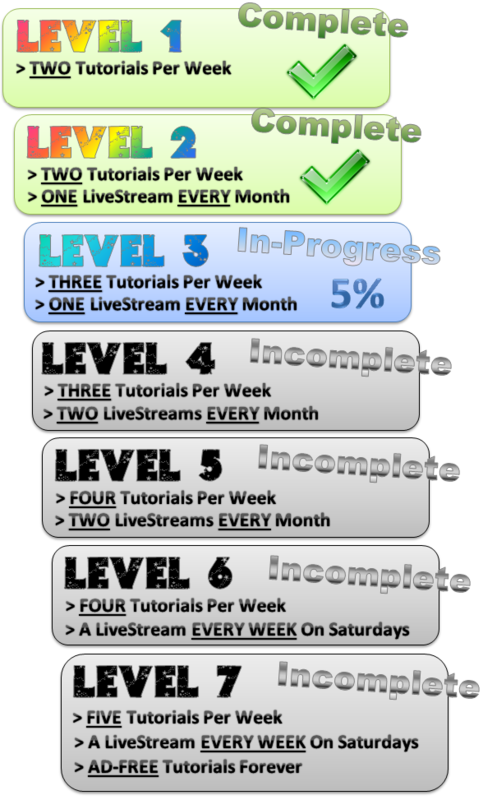 EXCLUSIVE ACCESS to tutorials which will not be available to regular YouTube viewers. Monthly Q&A Session with Patrons who have questions about literally anything. A FREE download of one of Jimmy's Tutorial projects! 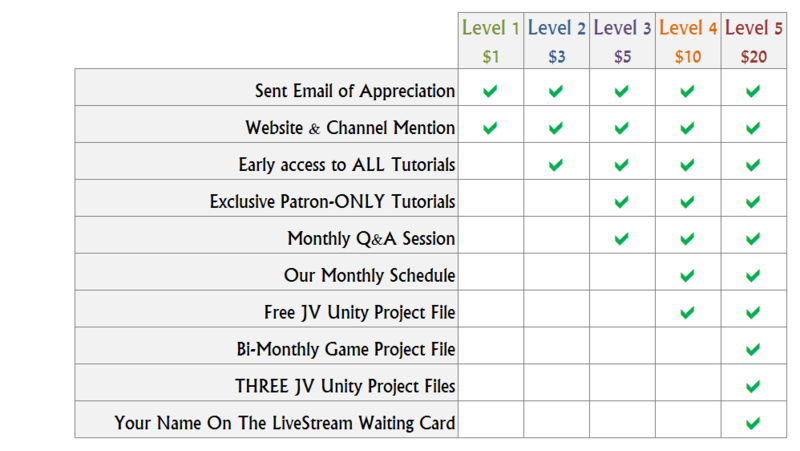 Get a free Game Project file to build on every 2 months (Even numbered Months). Contains all the extra assets and scripts you'll need.